Welcome to the world of custom woodworking! Here at Bailey Custom Woodworking, we are excited to guide you into the depths of awe-inspiring woodwork and craftsmanship. To get started, we want to introduce you to the main styles of kitchen that we see. Cabinet styles range from casual to contemporary, rustic, traditional, and a number of others. These styles can be combined in a range of fusion cabinet styles that, though rarer, can offer the unique panache that your kitchen demands. Bailey Custom Woodworking provides the best custom carpentry in Springfield, IL for the best custom kitchens. Rustic designs carry the themes of reconnecting with the past, heritage, and nature. Rustic cabinets often harken back to when the owner of the home or the local carpenter was the only way you could get cabinets. These styles use the natural look of the wood and a select clear finish to bring out the colors and look desired. Rustic cabinets and kitchen designs evoke a connection with nature and also the calming, cozy tones of lighter wood colors such as pine or maple. If paint is present, it is oftentimes rough or faded and may be made of repurposed barn or fence sood. When planning a rustic kitchen, be sure to consider other natural features your home may have, as the exposed wood and stone features are often a great combination. When considering the cabinet designs, rustic kitchen layouts often work well with both full cabinets and open spaces to visibly store books, baskets, kitchen supplies, and more. Contemporary styles are harder to pinpoint due to the ever moving target and interpretation of what contemporary means. For many, this means minimalist design and a variety of possible materials, but always simplicity, simplicity, and more simplicity. 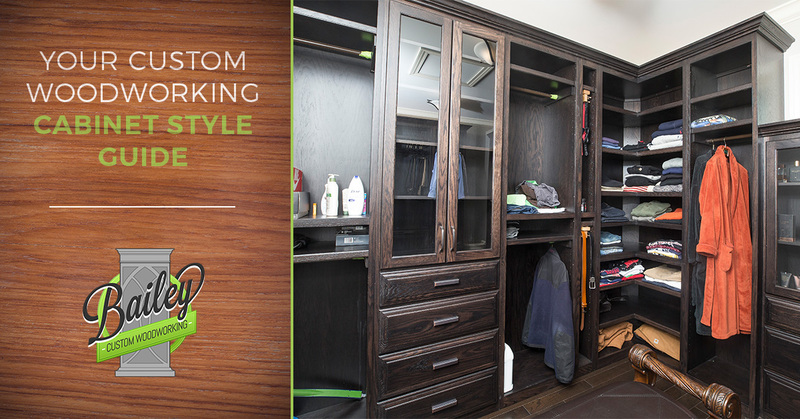 When looking for contemporary cabinetry, you can’t go wrong with custom made. This allows a homeowner to truly take control of the design and find the contemporary look you desire instead of picking a factory-made cut-out that is in a dozen different kitchens around the country. With contemporary custom cabinets, the biggest question is feel. You can go for the pristine white on white that simply screams clean, or something that is modern, chic, and warm—a place that is made to be cozy and inviting for casual conversation and tea. There are countless options, and each has its own feel. Remember to consider the elements of your kitchen as well. The ceiling height, window size, and general layout should be considered when settling on a design. If you are in the Springfield, IL area, we can help you plan. Traditional kitchens draw from a more formal past in a number of ways. It is in this design bracket that the difference between quality custom cabinetry and commercially produced cabinets are the biggest. To truly evoke and get a sense of the past, custom woodworking and custom cabinetry are a must. Any traditional kitchen depends on the quality look of the cabinets and will have exposed, finished wood with ornate patterns that can include borders, crown molding, braces, and real stone countertops. Further, lighting designs are often made to compliment the workmanship. This is the real difference in kitchen panache vs. kitchen mimicry. What custom woodworking project can we help you with? ©2018 Bailey Custom Woodworking - Do not copy. All rights reserved.